Mole National Park is the largest and the oldest national park in Ghana and an important bird area, yet its waterbird fauna is poorly documented because it is situated in the northern ecological zone far away from the coast of Ghana. Information on the seasonal variation in the park's bird abundance and diversity is generally patchy but necessary for effective birdwatching planning and management of the park's birds. 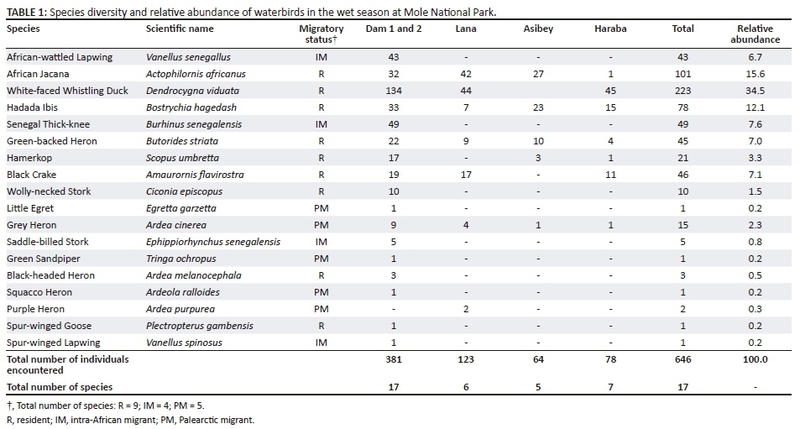 Therefore, as a guide to potential ecotourists interested in waterbirds, this study described the seasonal variation in waterbird species diversity and abundance at Mole National Park. As waterbirds mostly congregate around open wetlands and their abundance is more appropriately determined by counting all individuals in the congregant, data were collected using the total area count of waterbirds from August 2015 to October 2015 (the wet season) and from December 2015 to February 2016 (the dry season). Secondary data on arrival of tourists in the park were also analysed. The park's waterbird species richness was 29 in the dry season compared to 18 in the wet season. There was significant difference (p < 0.05) in the abundance of waterbirds in the dry season in which 4014 waterbirds were encountered compared to 646 in the wet season. 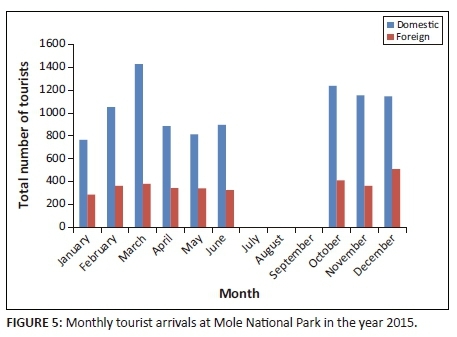 The yearly tourist arrival data at Mole National Park shows an increasing trend with peak visitation period occurring during the wet season. The chances of tourists encountering more species and numbers of waterbirds in the park are higher in the dry season compared to the wet season. Although several studies on waterbird ecology have been conducted in West Africa because of the region's importance as wintering habitat for Palearctic migrant waterbirds (Gbogbo & Attuquayefio 2010; Gbogbo et al. 2013; Gbogbo, Yeboah & Billah 2014; Ntiamoa-Baidu et al. 1998; Ntiamoa-Baidu, Nyame & Nuoh 2000), the studies are largely restricted to the coastal ecological zone in the south. Scientific studies on the ecology, diversity and abundance of waterbirds in the northern ecological zone of Ghana are rare. 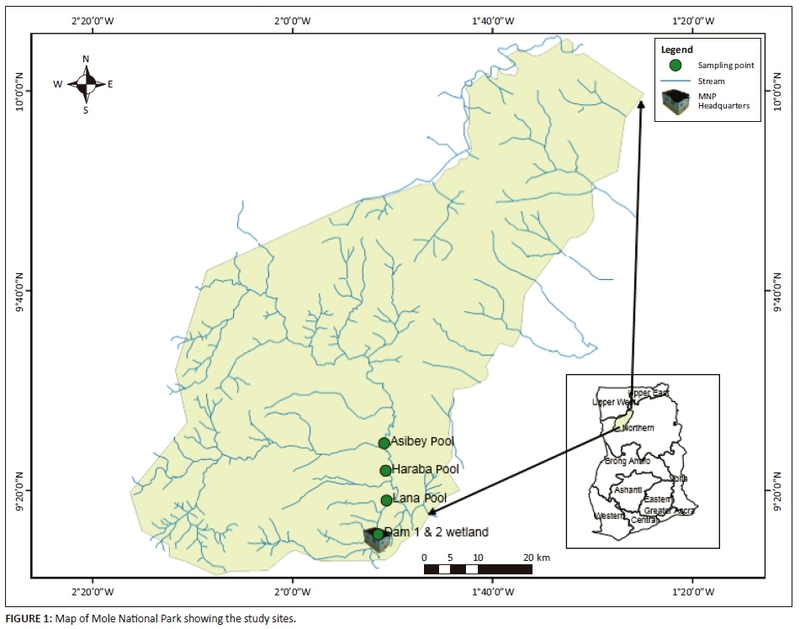 In Ghana, for instance, the only notable works previously conducted in the northern ecological zone of Ghana include Greig-Smith (1976, 1977), Dowsett-Lemaire and Dowsett (2005), Obodai and Nsor (2009), Nsor and Obodai (2014) and Aikins, Ziblim and Tuga (2017). Although these studies established some baseline data on birds and assessed environmental determinants influencing seasonal diversity and abundance of birds, none of the studies focused solely on waterbirds. Mole National Park attracts a large number of tourists (Lawer, Nasiru & Kuuder 2013). Although charismatic mega-fauna, such as elephants, remains the focus of many of these ecotourists in Mole National Park, birdwatchers are also frequently seen with about 41% of the park visitors expressing interest in birds (Kuuder, Bagson & Aalangdong 2013). In planning a successful ecotourism trip, information on seasonal variations in the diversity and abundance of fauna is paramount to the interest of tourists so as to improve the reliability of locating animals (Kuuder et al. 2013). Thus, scientific knowledge on the seasonal variation of waterbirds species diversity and abundance at Mole National Park will appropriately guide the park's potential birdwatchers in planning their trips. Besides, knowledge on the seasonal variation in waterbird species diversity and abundance of the wetlands at Mole National Park would serve as an important management tool for the park's wetlands. This study therefore reported the variations in diversity and abundance of waterbirds in the dry and wet seasons of Mole National Park. Mole National Park (9°12′-10°06′N, 1025′-2°17′W) (Figure 1) was established in 1958 as a game reserve, and in 1971, it was upgraded to a national park. 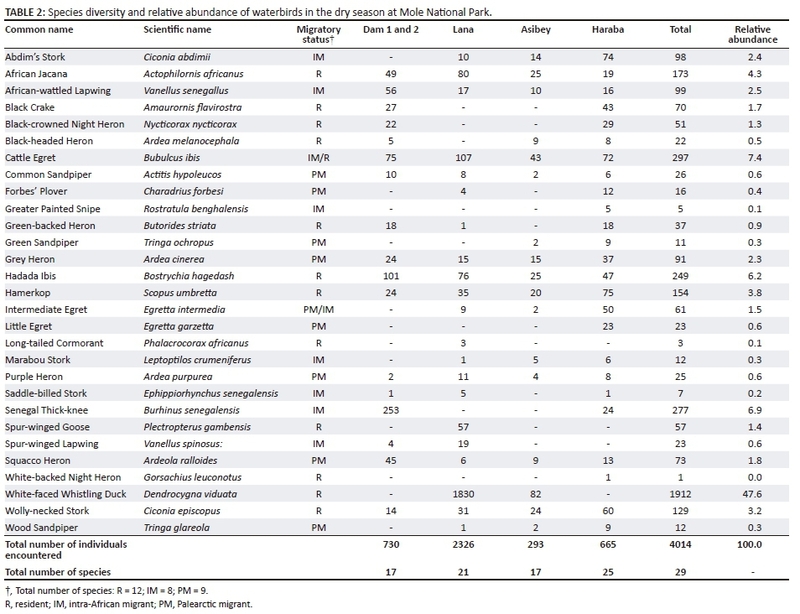 A total of 344 bird species have reliably been reported to occur in Mole National Park, and this is the largest number of species reported for any conservation site in Ghana (Dowsett-Lemaire & Dowsett 2005; Ntiamoa-Baidu et al. 2001). It covers an area of 4840 km2. It is located in the Guinea Savannah ecological zone with Isoberlinia doka, Butyrospermum paradoxum, Burkea africana, Combretum spp. and Terminalia avicenniodes as the common plant species. The park experiences two main seasons: the wet season (May to October) and the dry season (November to April) (Kuuder 2012). The Mole, Samole, Lovi, Zuo, Polzen and Kulpawn rivers are the major rivers that drain the park with only Polzen, Kulpawn and Mole flowing permanently; the others are reduced to stagnant pools in the dry season (Kuuder 2012). This study was based on the most important and prominent wetlands in the park that are easily accessible to the park users (Figure 1): (1) Dam 1 and 2 Wetland, (2) Lana Pool, (3) Haraba Pool and (4) Asibey Pool (Aikins, Gbogbo & Owusu 2018). 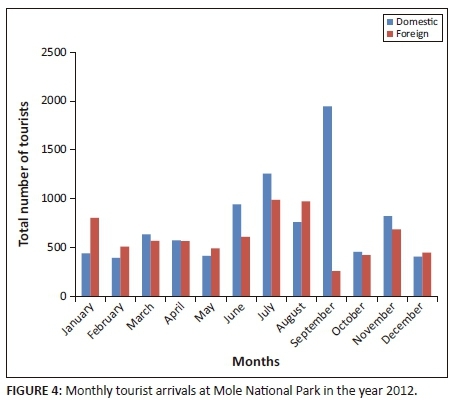 Secondary data on tourist arrival at Mole National Park was obtained from the park and analysed for trends in the arrival of tourists. The data obtained span from 1988 to 2015. The data obtained for 1988-2012 consisted of only yearly totals. However, there was monthly data for 2012-2015 although there were some missing data on some of the months for the years 2013-2015. Therefore, the analysis of the monthly data was based on the years 2012 and 2015 only. The value for the similarity indices ranges between zero (0) and one (1), with zero implying no species overlap, 1 = complete overlap, < 0.25 = similarity is very low, 0.25-0.50 = similarity is moderate, 0.50-0.75 = similarity is high and > 0.75 = similarity is very high. The data were subjected to Shapiro-Wilk tests of normality. 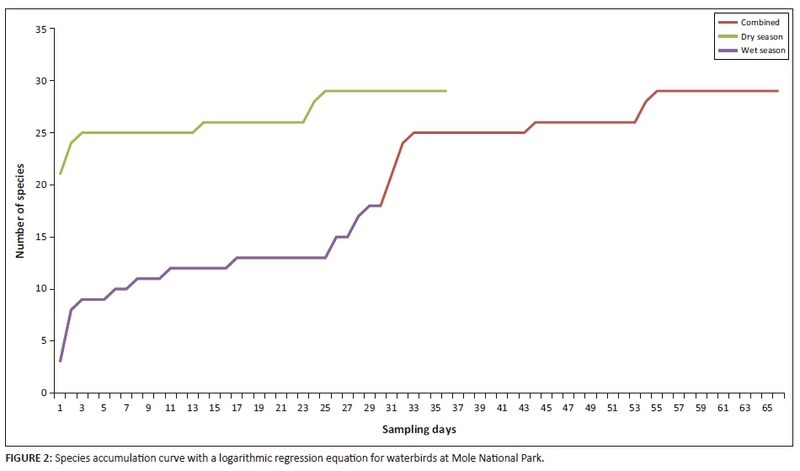 As the data were not normally distributed, a non-parametric test, Mann-Whitney U test, was used to test for the existence of significant difference in the abundance of waterbirds at the various study sites between the wet and the dry seasons. Mann-Whitney U test was used because few constraints apply to this test (Nachar 2008) and it is one of the most robust non-parametric test (Landers 1981), as it is at less risk to give a wrongly significant result when there is presence of one or two extreme values in the sample under study (Siegel & Castellan 1988). Also, Kruskal-Wallis test was used to test for the existence of any significant difference in the abundance of waterbirds among the four study sites. 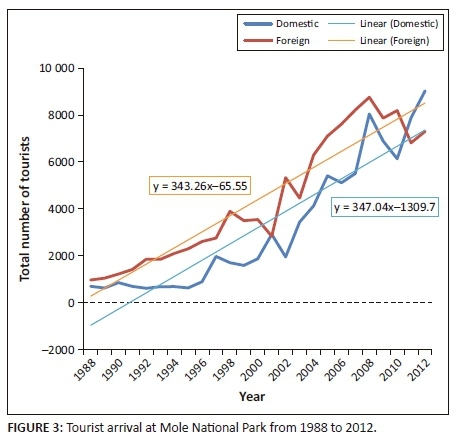 Yearly data on tourist arrival at Mole National Park for the years 1988-2012 were analysed for trend using linear regression and the results presented using a line graph. Also monthly data on arrival of tourists for the years 2012 and 2015 were presented using bar graphs. A total of 646 waterbirds were encountered during the wet season compared to 4014 in the dry season. In general, there was a significant difference in the abundance of waterbirds between the dry and wet seasons with the dry season recording a significant higher number (110.41±159.41) of waterbirds than the wet season (21.40±16.96) (Table 4). Further, pairwise comparison of the mean waterbird abundance in the wet season with that of the dry season indicated a statistically significant abundance of waterbirds with the dry season recording the highest numbers than the wet season on each of the four wetlands (Mann-Whitney U; p < 0.01) (Table 4).